I was in the UK last week, visiting the set of Top Gear, a little show about motor-carriages you’ve probably never heard of. During the few down moments we had, mostly when they were hosing off the hosts behind the building, I managed to get out and poke around some of the interesting cars right near the studio. Join me and let’s explore! I feel like I need to make a number of things clear before you watch this. First, none of the areas I was in here are actually officially part of Top Gear. The set is in a hangar at this little airport/industrial park, and these cars are not necessarily even owned by people affiliated with the show. Some are, but I think most aren’t. I’d also like to make clear that I was sick as a dog here and hopped up on cold medicine, so as I watch this, I can see evidence that my brain wasn’t operating at its full capacity, which is something close to what your first cellphone was capable of. Here’s some things I noticed right off the bat: when talking about the Alfa Romeo badge, I said the figure being eaten by the dragon was variously called a baby or a Moor or a “person.” Jeezis, Jason, babies and Moors are also people, dummy. I misspoke. I’m not saying I don’t think babies are people, or that ‘Moors’ aren’t worthy of being eaten by a mythical dragon-snake like any of us. Also, I called a Volkswagen Lupo a ‘Polo,’ like an idiot, and I walked right by a Porsche 911 Turbo and probably other cars that will make you wonder what the hell my problem is. Also, the wind is making my hair look even more ridiculous. So, yeah, I’m a dipshit. There’s just no escaping that, sometimes. But I sure was excited to see that Suzuki Whizzkid. 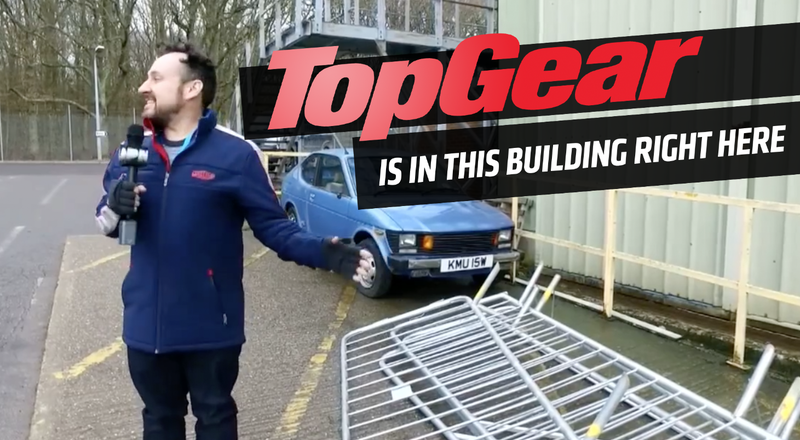 If you can just filter out all my problems, maybe with just a little pity, then I think you can at least enjoy this little behind-the-scenes look at the mundane reality of Top Gear’s surroundings! Oh, and I asked that shop if they had a water pump for my Scimitar. They didn’t, but at least they knew what the hell I was asking for, which was a refreshing change of pace!